“The Human Rights Council has been a protector of human rights abusers, and a cesspool of political bias,” said U.S. Ambassador to the UN Nikki Haley in a statement. While it comes as no surprise to many, the move has been condemned by global human rights groups. “It is the latest in a series of gestures that says we’re really only interested in transactional diplomacy—you give us something we want, and we give you something you want and we better get a better deal,” Oxfam America’s Humanitarian Policy Lead Scott Paul told IPS, noting that it undermines human rights around the world. Created in 2006, the Human Rights Council (HRC) plays a vital role in addressing rights violations around the world. It has initiated investigations in Syria, Yemen, Burundi, Myanmar, and South Sudan while also raising awareness and discussing key topics such as disability rights and violence against women. Last month, the Council accused Israel of excessive use of force during demonstrations at the border and voted to probe killings in Gaza. Paul also noted that the U.S. withdrawal is ill-timed as the country’s human rights record is “rightly” under the spotlight. “Quitting this body doesn’t in any way protect you from the scrutiny of the world, or from being assessed by international standards of human rights law…all of those issues are going to continue to be discussed,” Kumar said. In a letter, Haley attacked human rights groups including Human Rights Watch for opposing her recent push for a General Assembly vote on changes to the Council. “You put yourself on the side of Russia and China, and opposite the United States, on a key human rights issue. You should know that your efforts to block negotiations and thwart reform were a contributing factor in the U.S. decision to withdraw from the council,” Haley wrote. Though Haley promised to continue to work to reform the HRC and to engage in human rights in other fora such as the Security Council, it could be difficult to make significant progress. For instance, China, a member of both the HRC and the Security Council, has blocked a number of justice and accountability measures at the Security Council including those concerning Syria. Russia has vetoed Security Council action on Syria 12 times, and very little progress has been made to help protect Syrians. “So its a rhetorical slight of hand for her to say that the U.S. is still committed to human rights and will pursue it in other spaces when they are walking away from the primary body dedicated to human rights,” Kumar told IPS. Not only are they withdrawing their membership, the U.S., with almost 18 months remaining on its term, is refusing to attend anymore meetings. Kumar noted that the move is “really rare” as countries often attend meetings if they come up on the body’s agenda and even if they are not members but are committed to human rights. 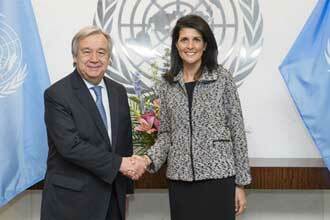 “To say that they are not going to come at all is a pretty significant step away from multilateralism,” she said. “It is really deeply disappointing,” Paul said, noting the withdrawal is a major step back from the U.S.’ legacy at the HRC. While their engagement with the Council has been spotty, the U.S. has helped some of the body’s key decisions such as the creation of a commission of inquiry into human rights violations in North Korea. The U.S. has also played a leading role on initiatives related to Syria, South Sudan, and Sri Lanka. While the HRC is not a perfect institution, the U.S. move to abandon ship does not help the Council either, Paul noted. “I don’t think we should expect perfection over institutions, I think we should work to make them more perfect…simply walking away because it’s not going so well or because we are not getting everything we want isn’t actually the way to make things better,” he told IPS. “They are taking themselves off the field and out of really important conversations and that’s something that is going to have reverberations for years to come,” Kumar reiterated. And just because the U.S. is leaving the Council also does not mean that the North American nation should leave behind its commitments to human rights. “At some point, we will be back at the table. And in the meantime, we will be doing everything we can to hold our own government to account,” Paul concluded. The U.S. joined the HRC in 2009, previously refusing to be involved under the Bush administration due to concerns over the body’s members. Among the HRC’s members are Burundi, the Philippines, and Venezuela. It is the first time a member has voluntarily withdrawn from the Council.